This mod adds new phenotypes and a tail model that allow characters to ride a barrel, originally created for The Immortal Module by McV. 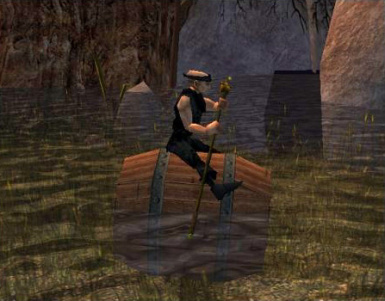 Only floating and paddling animations are present, so there are currently no animations for combat, spellcasting, etc. All genders, races, normal and large phenotypes, and robes are supported, but cloaks and the two "coat" robes are not. Once you've installed the file(s), open a module and select Edit -> Module Properties, then select the Custom Content tab. There, select ridable_barrel from the drop-down list and add it. Let the module build, and then save. Once added correctly (as detailed above), an NPC (or PC) can be setup to ride a barrel by setting phenotype to "Barrel" (there are two phenos; the first  is for normal phenotype characters, the second  is for large phenotype characters) and tail type to "Barrel" (491). Individuals and custom content teams are welcome to use, modify, and combine this content in whatever way they desire, without any need to seek my permission. This mod was created for a fairly specific purpose and is released as-is; The community is of course welcome to expand upon it (with additional or improved animations and more barrel types).